If you read the woodworking magazines or look online, you often come across instructions for filling pores, glazing, toning, rubbing out and so on. These are wonderful techniques for use on sophisticated projects such as furniture. But they are often overkill for basic kitchen or bathroom cabinets. What is often referred to as a cabinet-grade finish involves just three — maybe four — steps. These are wood prep, sealing, topcoating and sometimes staining. Preparing the wood for a finish involves sanding, steaming out dents, filling gouges and dealing with glue seepage. Glue on the surface can cause a lighter coloring, especially when staining. The goal of sanding is to remove mill marks and other flaws. You need only sand enough to accomplish this goal and leave a surface that doesn’t show sanding scratches when the finish, or stain and finish, is applied. Sanding more than this or sanding to a finer grit than needed is a waste of time. In most cases, begin sanding with 80 or 100 grit and end with 150 or 180 grit. There’s rarely a need to sand finer than 180 grit as long as you finish by hand sanding with the grain. If you don’t do this, and especially if you’re using a random-orbit sander, you might need to sand to 220 grit. Dents can often be steamed level. Drip some water into the dent, then turn it into steam by touching it with a hot object such as a burn-in knife or soldering iron. Alternatively, cover the wetted dent with a cloth or cardboard and apply heat with a hot iron. Wetting a larger surface by applying a wet cloth also works, but it raises the grain over the entire area, which then requires more sanding. When the dent is level, sand the surface smooth. Gouges can’t be steamed level because some of the wood is missing. Instead, fill them with solvent-or water-based wood putty. Some brands are available in wood tones, which you can use to your advantage. Experiment on scrap until you find the color that most closely matches the end color after finishing or after staining and finishing. Wood putty doesn’t take stain like wood does, no matter what the claims. Glue seepage needs to be removed or it will block penetration of the stain or finish and result in a lighter color. Avoid this problem by applying less glue and keeping your hands clean. Remove glue seepage either by washing off the still wet glue with a wet rag or waiting until the glue begins setting up and lifting off the glue line with a putty knife. Either way, you need to finish up by sanding the area because some of the glue will have penetrated. If you have applied the stain before you notice the problem, sand or scrape off the glue, then sand the entire part wet with more stain if needed to even the coloring. Sealing is accomplished by the first coat. This coat can be the finish itself or a separate product used to solve a problem. Whatever you use, you should sand this first coat to create a smooth surface for subsequent coats. Otherwise the roughness will telegraph through. Sanding sealer and catalyzed sealer make sanding easier (though don’t use sanding sealer under catalyzed finishes because the bond with the finish isn’t good). Vinyl sealer improves water resistance. Water-based finishes and oil-based polyurethane are water-resistant and sand easily, so no special sealer is needed. Shellac is often mentioned as a sealer, but it is needed only when trying to block off a problem in the wood, such as silicone, odors from smoke or animal urine or oily resin naturally in the wood. Shellac is a useful sealer when refinishing, but rarely needed when finishing new wood. The topcoat is critical because it’s the layer that contributes to the durability. It also provides the sheen and some of the coloring. If applied evenly with a spray gun, the topcoat can be nearly flawless to the eye and touch. 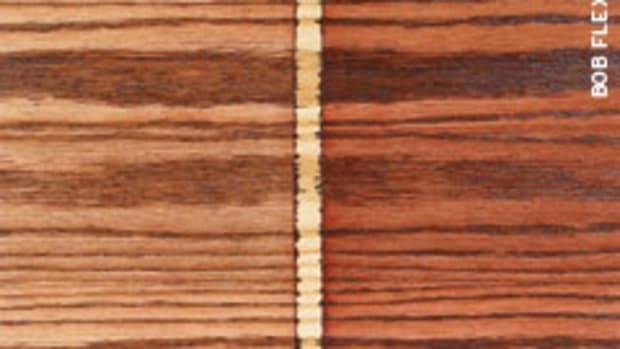 • Nitrocellulose lacquer is the most forgiving to use, but also relatively susceptible to water damage and abuse. • CAB-acrylic lacquer is similar, but without the yellow/orange coloring of nitrocellulose. • Pre-catalyzed lacquer applies like nitrocellulose lacquer, but it’s considerably more durable. • Post-catalyzed lacquer requires an acid catalyst to be added, which makes it a little more complicated to use. It also has a relatively short pot life. • Catalyzed (conversion) varnish also requires adding a separate catalyst, but it’s the most durable of the catalyzed finishes. Many things can go wrong during application, so follow the manufacturer’s instructions exactly. • Water-based finish is more scratch-resistant than nitrocellulose lacquer, but otherwise has about the same durability. It is more difficult to use because of problems associated with the included water, but there’s much less odor and no color. The most common error made in topcoating cabinets, whichever finish is used, is not coating the edges of the doors well enough. A thin finish at these locations is quickly broken through by water. Pay special attention to these edges to be sure that you are applying enough finish. • Blotching is usually caused by irregularities in the wood, especially in tight-grained woods such as birch and cherry. To achieve an even (though lighter) coloring, apply a washcoat (the finish thinned to 3- to 10-percent solids content) and let it dry before staining. • Darkened end grain is primarily the result of inadequate sanding. The still-rough surface retains more stain when the excess is wiped off. Use the same washcoat procedure described above to help even the coloring. A washcoat will also stiffen the wood fibers so they are easier to sand smooth. You can use a rag or brush to target the washcoat just to the end grain. • Poor bonding is most often caused by not wiping off enough of the excess stain. In contrast to paint, stains don’t contain much binder, so they don’t have much cohesive strength. The slightest knock against the finish separates the coating at the thick stain layer and the finish peels. • Poor bonding can also be caused by applying a water-based finish over an oil-based stain before it has thoroughly dried. Test your procedure on scrap before committing to a full set of cabinets. This article originally appeared in the July 2014 issue. Many shops use oil stains to get the color they want on projects. Oil stains are widely available at paint stores, home centers and distributors and they are very easy to use because they provide a long working time.